A 70-year-old woman, identified simply as Mrs. Egunjobi, a London returnee, has allegedly been raped to death by a 33-year-old Dare Garuba, New Telegraph reports. 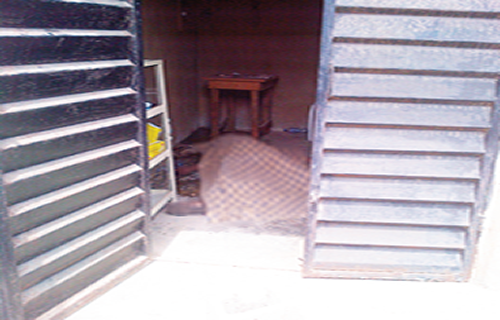 The incident occurred in Egunjobi’s shop at Mowe in Ofada-Mokolokin Local Council Development Area of Ogun State. Witnesses yesterday said that the woman had taken two bottles of Alomo gin and became intoxicated. When she started misbehaving, the suspect reportedly offered to lead her home so that she would not be injured. However, when Garuba led Egunjobi into her shop, he decided to take advantage of her. The incident, which occurred about 11p.m. on Sunday, forced some of the traders in the area to shut down their shops yesterday when the news of her death filtered into town. It was learnt that the suspect was the only one who approached Egunjobi and called the attention of some of the residents to the woman. The Coordinator of Oodua People’s Congress (OPC) in the area, Mr. Bamidele Ayeyemi, said they were outside about 11p.m. when a Hausa man, who went to defecate in a nearby bush close to the woman’s shop, discovered that her shop opened. According to Ayeyemi, the man raised the alarm, thinking that armed robbers had broken into the shop. The body inside the shop Gov. Umahi Another resident, who identified himself simply as Balogun, said after the remains of the woman had been taken care of; they went to report the incident to the head of the community and policemen at Mowe Division. It was learnt that Garuba was still making love to the woman without knowing that she had died. The Divisional Police Officer (DPO), Mowe Police Division, was said to be at the scene of the incident with the woman’s husband. But the widower refused to comment on his wife’s death. Garuba’s mother, Mrs. Jumoke Musa, said she was fed up with the attitude of her son. She said: “I have done everything to prevent him from becoming a hoodlum. I left him with his father’s family after his father’s death because I have remarried and I did not want to endure his way of life. The victim’s body was in her shop, covered with a piece of cloth yesterday.